The Post-Traumatic Bluesmen of Orkid are returning to Expirat with a more cinematic and visually enforced project than ever before. Suruaika is a giant and incredibly powerful cat, that we all met at some point in our life, with little or no acknowledgement of its true nature. It is also the name of the first instrumental EP/soundtrack that Orkid will release on that spring day and the title of the animated short film Vlad and Radu are working on these days. Their second release of the day will be a short trailer for the movie project. Orkid is a crazy bunch of angry shoegazers that share a great respect, admiration and love for all the beasts of the world, particularly for the sea monsters. The Bucharest based quartet on a continuous and neverending quest for improving the means of communication between marine, terrestrial and extraterrestrial life forms. Also available on Apple Music, Google Play, Amazon, Pandora, Deezer, Tidal, Microsoft Groove, ClaroMusica, Saavn, MediaNet. Adrian Tabacaru is a polyvalent artist. One of the most appreciated drummers in town, he is also a complex musician, composer and multi-media artists. His show combines different music genres Jazz Fusion / Psychedelic-Electro / Epic Prog-Rock / Dubstep with interactive visuals and lights, for a magic performance. His musical inspiration comes from Classical music, Jazz Fusion, Electronic music and Progressive Rock. 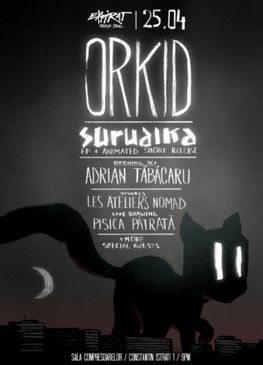 The visuals of the Orkid gig will be done by our friends at Les Ateliers Nomad. And our brother and amazing artist Pisica Patrata will do some live drawing on the new songs.